Home » Electrical Safety » Electrical Safety Program » What is “Exposed”? For higher voltages (above 1000 V) there is an additional risk. The voltage is high enough to arc across an air gap, and you don’t have to make contact for it to be a hazard. In this case there are safe approach distances. Proper enclosures that surround the conductors and keep people far enough away are sufficient to guard against the hazard. How can you tell if it’s Exposed? Determining whether a hazardous part is actually exposed is usually obvious, but not always. For times when a closer look is required, we use an articulated test finger. If the test finger makes it past a guard or through an enclosure opening and touches a circuit part, then the part is considered exposed. 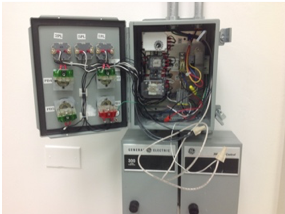 In these cases, we often re-engineer the guard or enclosure to properly eliminate the hazard exposure.